Anderson Cooper’s new syndicated talk show began on Monday. Welcome to Life… After Oprah. Monday marked a new era in syndication as repeats of The Oprah Winfrey Show came to an end on Friday (her last original episode aired on May 25) as the broadcast business is without the queen of talk for the first time since Sept. 5, 1986 as Oprah Winfrey decided to devote more time to her fledgling cable network. 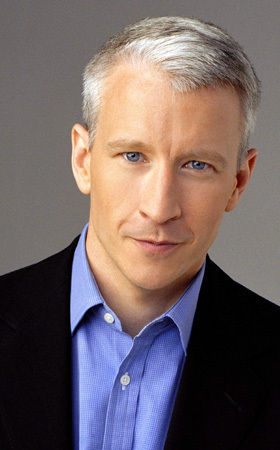 Warner Bros.’ Anderson (WFLD, 2 p.m.) – as in Anderson Cooper – is a vehicle for the likable CNN personality and 60 Minutes correspondent who plans to cover a wide variety of topics, though Mr. Cooper has stated the series isn’t a news program despite his hard news background. Also on tap is CBS Television Distribution’s Excused (WCIU, 11 p.m.), which tries to bring the dating/relationship genre, which was popular in the late 1990’s/early 2000’s (think Blind Date) back into the forefront. Entertainment Studios is launching a pair of freshmen strips this week: We The People (WMAQ, 12:30 p.m.), yet another courtroom show with Gloria Allred as the Judge (yikes), and Who Wants To Date A Comedian (WCIU, 3 a.m.). Yes,Who Wants To Date A Comedian is a real show. Ladies and Gentlemen, I can’t possibly make this stuff up. Meanwhile, Debmar-Mercury and ITV Studios USA are premiering new newsmagazine strip America Now! hosted by Orland Park’s own Bill Ranceic and former Entertainment Tonight co-anchor Leeza Gibbons. The series, airing primarily on Raycom-owned stations (such as WOIO in Cleveland and WXIX in Cincinnati), currently does not have a Chicago clearance. Other new first-run strips set to debut next week include Debmar-Mercury’s Jeremy Kyle (WFLD, 1 p.m.), The new – and hopefully improved – Bill Cunningham Show (WGN-TV, 2 p.m. in a limited national rollout) and Dr. Drew’s Lifechangers (WGN-TV, 3 p.m. and 3:30 p.m.), which is cleared primarily on CW affiliates. There is a lot of activity this year in this arena as five new off-network sitcoms and the return of Law & Order: Criminal Intent to broadcast syndication vie for audience. – The two big off-net entries this year are Warner Bros. The Big Bang Theory (WPWR, 6:30 p.m.; WFLD, 10 p.m.) and 30 Rock (WGN-TV, 6:30 p.m. and 10 p.m.). Both series also start their cable runs this year: TBS has Big Bang and WGN America and Comedy Central are airing 30 Rock. How this will effect local stations’ ratings remains to be seen. Both debut September 19. – Expanding from four weekend episodes to a daily strip on the same date is Twentieth Television’s animated American Dad (WCIU, 8:30 p.m), while sister animated series Futurama begins its syndicated weekend airings (WCIU, Sat. 7-8 p.m. and 10-11 p.m.) on September 24. – NBCUniversal’s Law & Order: Criminal Intent returns to weekday syndication for the first time since September 2009 as a double-run strip (WPWR, 10 p.m., 11 p.m.). If that wasn’t enough, the original Law & Order makes its appearance in broadcast syndication for the first time ever as weekend offerings. Look for the series on WPWR the weekend of September 24. – Last – and certainly least, is a series no one thought would make syndication, since nobody watched this series on Fox. But Brad Garrett vehicle Til Death did, and you can catch the Sony-syndicated series while you can on WCIU-TV Sunday nights at 9 and 9:30 p.m. If you can stomach this series twice a day, then head over to WCIU’s sister station (UToo – available on OTA channel 26.2) for two vomit-inducing episodes back to back from 4-5 p.m.
– As noted here two weeks ago, Warner Bros. passed on renewing Judge Jeanne Pirro for another season. – Also gone is The Real Housewives…, whose reruns (and new episodes) still can be seen on Bravo. – Game shows 5th Grader and Don’t Forget The Lyrics end their syndicated and My Network TV runs this week. – Other syndication cancellations include Reno 911!, Deadliest Catch, and Smash Cuts. – Finally, there’s always a year where a syndicated project fails to get on the air. This time around, its Geek Meets Girl, a proposed series from Trifecta Entertainment that was scrapped at the last minute. In recent years, other proposed Trifecta series (Hacienda Heights and One in a Million) met a similar fate.